First on my list was knee cut counters. David began by suggesting you grab the foot from a reverse de la Riva position. If you mess up and they have gotten a knee through, you're in trouble. They want their balance centered, you want to disrupt that. Bump them with your knee, with the intention of swivelling up behind them. It could be either knee, depending on the position. Pulling on the collar can help you with that too. You will end up in a scramble, like Haueter said, meaning that a wrestling approach will pay dividends. You're spinning through behind the leg, looking for the back or possibly moving into a single leg off that position. If you can get some kind of purchase on their leg, you can turn, rolling them over. Securing a collar and grabbing their knee will help with this too, stiff arming to stop them recovering their position. If they don't fall over (e.g., you end up with their leg, but they still have some base), hook the leg as you turn, then stand to complete the single leg. If they are on their knee, you can tap that knee and drive through. A late option is to try and spin through, your arm going underneath their body. Your other arm loops over their head, ending up in a brabo choke type thing (anaconda? I get confused as to which is which). To complete the choke, you're curling your body around their head. Along with knee cut counters, I more generally want to improve my open guard, particularly the sitting guard frames I've been playing with from Ryan Hall. Rather than curling your arm in when you have it behind their head, make sure you're redirecting that head. That's a great point, as like David said, just curling the arm ends up using triceps. In a related point (which applies to side control frames too), you can reach for their shoulder, getting the lower part of your forearm into the throat. 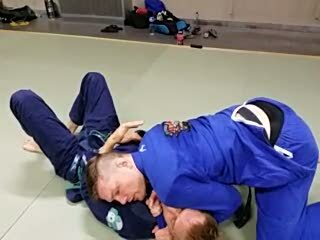 I'm keen on improving my chokes from side control too, as I go for those a lot. David had a nifty little tweak on my favoured gi tail choke. If you can't get the basic gi tail to work, bring your other hand through to grip on top of your first grip, similar to a baseball bat grip, but on the side. Lever their head up for the choke (David described it as a steering wheel), being careful not to put your forearm through too deeply.